My friend from the UK, Ruby2Shoes, is getting married in early May. I made a card last month and sent it on its way to her for the big day. I sure wish I could've stuffed myself in that envelope! A few months ago, Ruby had won a sheet of digital images from a challenge but passed them on to me (with permission) instead, because she thought they looked more like my style. I used one as a focal point here. 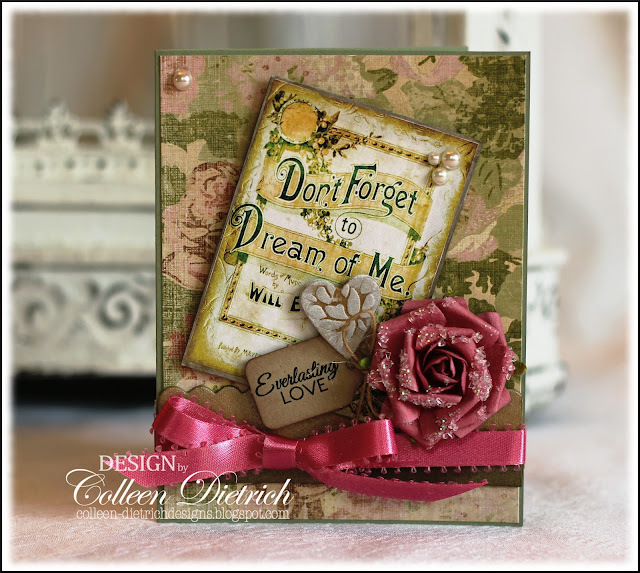 The sentiment - "Don't Forget to Dream of Me" - seemed fitting for a wedding card. Thanks for joining me today! I'll be here tomorrow with my first card as May's Featured Designer at Merry Mondays. See you soon! Paper: Mellow Moss - SU; Life's Journey - K & Co.
Other: flower - Prima; kraft tag die cut, chipboard borders - SU; vintage digital image; chipboard heart - Michael's; pearls - Queen & Co.
Colleen this is wonderful , it has such a Vintage feel without tons of different elements.The papers you have used compliment that vintage image perfectly. I am sure Ruby received cards from other crafters as well but that this one stood out from the crowd. LOVE this, Colleen, and so will Ruby! 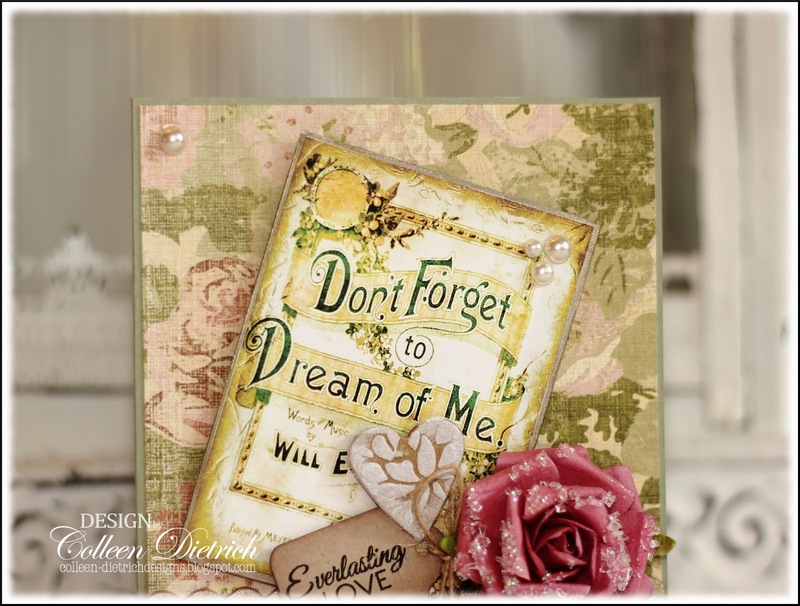 LOVE that sentiment and your papers and that chipboard heart! FAB card, TFS! This is just gorgeous - beautifully detailed! Love the rose! Hi Colleen! Been happy busy, so I haven't stopped by for a while. Wonderful to find your gorgeous new creation!! I just love your creativity! Beautiful card! Great pic! Guess I'm looking into getting a light tent so my pics will look awesome. I remember when Ruby won that Challenge, at Papercraft Star. I knew she was passing it on to you from our sponsor, theHouseAcrosstheBay, and she said you would make something wonderful ! Boy, was she right. The three pearls in the corner of the music sheet are so perfect. One of the prettiest wedding cards I have seen in a very long time, and I know she will LOVE it! this card is amazing...I love each and every detail that you put into your cards...the flower is perfect and that heart...so love it...great card. So beautiful! 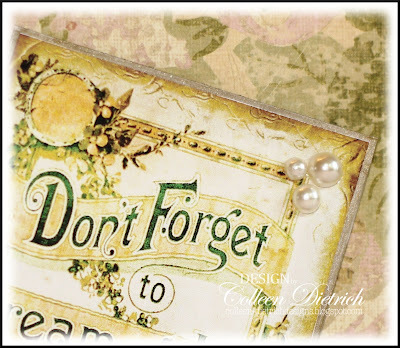 Love the vintage feel! Gorgeous vintage card Colleen! Love the flower and the pretty ribbon!! I know she will LOVE it!! Wow very pretty! So rich and the details are wonderful! LOVE it! Wow! This is gorgeous! Love the layering of the elements! Just brilliant! This is gorgeous Colleen, I did stop by yesterday but blogger was playing up and I couldn't leave a comment. 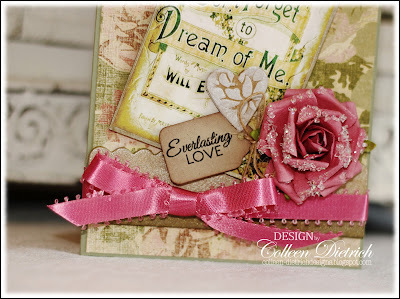 I love this vintage label, and the beautiful bloom, the sepia tones and the pop of the red ribbon and rose, it's gorgeous! Ruby will love it! If I marry my husband again, will you make me a card - exactly the same as this??!! It really is quite beautiful Colleen and love all the elements. Ooh, beautiful...those digis were meant for you. Love the 'Emily' flower and this did make an outstanding wedding card. Ohhhh, unbelievably beautiful! 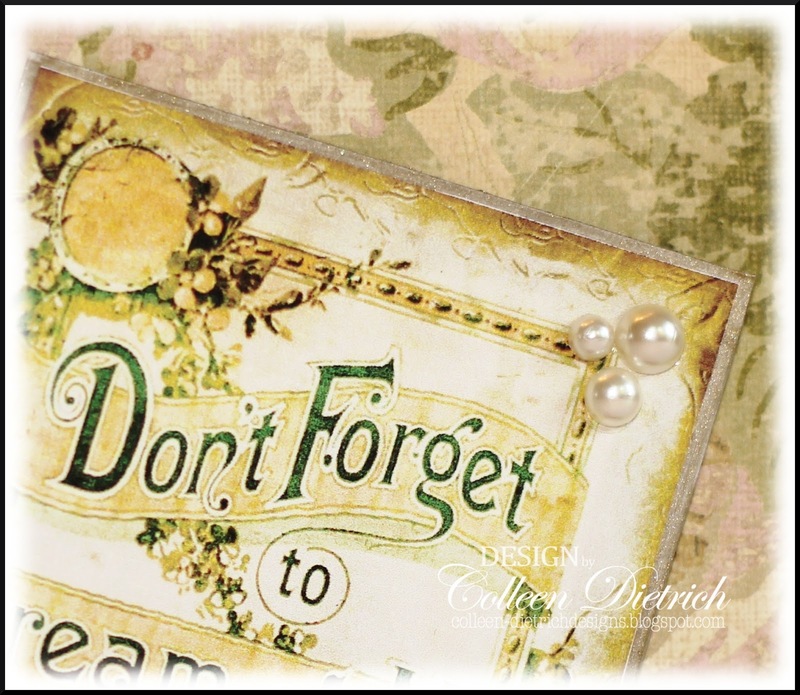 I so love the vintage digital, and you've used the perfect accents and colors with it. Gorgeous! How sweet to use something Ruby gave you to give it right back! And it's ever so beautiful to boot! This is amazing! I love the vintage feel and the flower! Thanks for joining us at Really Reasonable Ribbon!